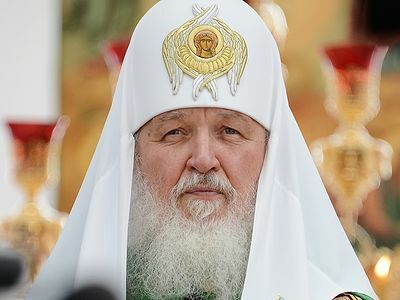 For the first time in the rank of Primate of the Russian Orthodox Church Patriarch Kirill is paying a visit to France. Patriarch Kirill has already held an Orthros of the All-Night Vigil a few minutes ago in La cathédrale des Trois Saints Docteurs et Saint Tikhon de Zadonsk in Paris. Patriarch Kirill has also visited the newly opened the Russian Orthodox Spiritual and Cultural Center, placed in the prestigious district of Paris. As well as the Russian Embassy, the center has the diplomatic immunity. This visit of Patriarch Kirill will be a great event not only for the French Orthodox, but also for the whole of France and the development of the Russian-French relations. Moreover, the opening of this center was postponed due to the cooling of Russian-French relations. Russian President Vladimir Putin had to postpone his trip to Paris, which was explained by just changing the opening date of the cultural center. Putin said that the purpose of his visit was the presence at this ceremony, rather than talks with his French counterpart François Hollande. However, the connection between Paris and Moscow was supported by His Holiness Patriarch Kirill of Moscow and All Russia, who had been previously sending letters of condolences to the victims of the attacks to President Hollande and Patriarch Kirill had received a warm response from Hollande. As Alexander Volkov, the patriarch’s press secretary said: «This event is a landmark event both for the diocese of Chersonesus and for Russian Orthodox Church’s all foreign parishes». So it could be considered literally. Most likely, this visit is intended to emphasize the interest of Russia, not only to their compatriots abroad, but also to France in particular and continental Europe in general (Moreover, the previous foreign visit of the Patriarch was in the UK). At the same time, Vladimir Putin’s absence at the ceremony makes it clear that Moscow will not accept anymore the authority of the French leader, which plays into the hands of Hollande’s party rivals in the upcoming elections.